We are opening again on October 7th after a nice September break. We originally closed because we knew that we would be so busy with Tori's wedding preparation in Pennsylvania. It was a very busy time, but since the wedding is past, we have had some free time. Ruth has escaped this Arkansas heat and has been traveling throughout Prince Edward Island with her husband, Jerry, and son, Daniel. They have been having a wonderful time! Betsy has been getting back into a routine of homeschooling her kids, managing her home, and making preparations for Humble Crumb's Fall Re-Opening. Tori is now happily married and living in Maryland with her husband. We will miss her terribly and can never re-pay her for all of the hard work and long hours that she put into making our little bakery what it is today. Thank you Tori! We have hired many wonderful workers to replace Tori. They are hard-working, people-loving, employees and we are so happy to have them be a part of our team. Our break has been nice, but we can't wait to re-open! This past Monday we launched our homemade breads using sprouted wheat! The process takes a bit of time, but the nutritional benefits are worth it! We buy the wheat berries in bulk and soak them for up to 3 days. Once the wheat has sprouted, the berries are dried overnight in a dehydrator. We then grind the wheat into our whole wheat flour. This week we made Sprouted Whole Wheat Bread, Sprouted Whole Wheat Cinnamon Raisin Bread, and Sprouted Whole Wheat Basil Bread. We also made two types of loaves with white flour: Our over-night Artisan bread and Sourdough Bread. Both of these loaves are crusty on the outside, soft on the inside and perfect for breakfast toast with butter, lunch sandwiches, or dinner garlic bread! We hope you'll make us your weekly bread supplier! Attached is an article from LIVESTONG.COM with many of the benefits sprouted whole wheat brings to our diet! Artisan Bread! Great for breakfast toast (Don't forget the butter!) or lunch sandwiches... YUM! There's nothing better than fresh, warm cinnamon rolls right out of the oven! Last Thursday morning, Betsy, Eli and I (Tori) had a business meeting concerning the next step of the bakery. We were still getting private orders and catering opportunities, but wanted to take it one step further. No better time than the present is what we decided! So right away, Betsy posted to Facebook that the tiny bakery would be open that Friday and Saturday morning! The support from friends was overwhelming and the news spread through "shares" and "likes" across the town. Friday morning came and the first customer arrived at 6:30 sharp! It was such a fun time to welcome neighbors into the tiny shop and it truly began to feel like a "community bakery." Saturday was pajama day! Elijah (Betsy's husband who also built the bakery) on the right with son Jed. Its fun to live next door to a bakery! 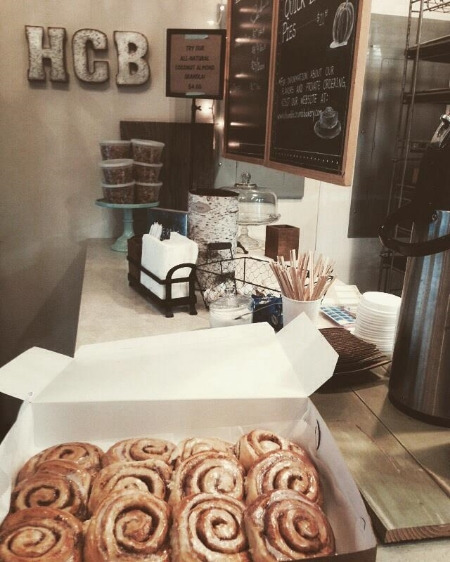 "This was the place the cinnamon rolls came from this morning. (Not donuts). Thanks ________________ for bringing them by. It's really close to my house on the other side. They were probably the best I've had, really!!!" Saturday was even more exciting! There were 3 customers who came that had heard about the bakery through Facebook. It is always an exciting thing to see new faces come in! It's also fun to see old friends come in, of which we had plenty! So at the end of Saturday, it was a perfect combination of customers.... some old, some new, but all friends now! The bakery will be open again this weekend, Friday December 11 from 6:30-9:00 a.m. and Saturday December 12 from 6:30-10:00 a.m.